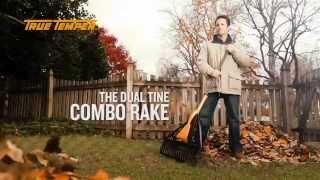 This True Temper innovative leaf rake is ideal for people who want to rake faster! The dual tines allow for a clean sweep as they quickly rake through grass and leaves. The head size is designed for jobs big and small, while the handle features a comfort grip texture for better control. Best of all it features a detachable Hand Rake for tight spaces!